As the saying goes, "I would be nowhere without my teachers". They have patiently and compassionately guided me to be a better and happier person. They have encouraged me to explore tirelessly the practices of yoga. They have inspired me to deepen and cherish my Sadhana and to hold it in a place of great importance. I first met Guruji in 1991 at the recommendation of Sharon Gannon. Guruji was the most joyful, thankful, wisest, sweetest man in the world...as one of his students we were all in wonder of this great being. "You pray God..... have no fear." Those were his words and they changed my life. I was introduced by a friend to Sharon Gannon and David Life in 1990 on the street in front of Prana; the pioneering vegetarian health food store in New York. Sharon had long black hair with a green stripe in it, was wearing a purple cloak and carrying a violin. David had a gentle and kind manner and looked at me as though he knew me from before. Within a few moments I had the feeling that this meeting was destined to happen and that I would spend the rest of my life learning from them. They have used their platform as yoga teachers to influence others to live lives that are in harmony with all others: plants, animals and humans alike. 30 years ago they put into motion a method of practice that linked the yoga of the time to the ancient yogic principles of love, reverence and devotion. Never does a day pass that I do not feel their ever expansive presence in my life. I believe that much of the yoga being taught around the world today , where the values of yoga are being preserved and taught well, has to do with the influence of these two fearless visionaries. Saraswati Jois is the daughter of Sri K. Pattabhi Jois. As his daughter she received his wisdom and teachings in the most abundant way. Since Guruji passed she has taken on the role of teaching what he taught through the sensibilities of a female, certainly serving as an inspiration to female teachers and students alike. As her student she carries on the tradition of her father in that when she is in the classroom one can do things they never thought possible....when in her presence her belief in her students opens the doorways of possibility in profound and wondrous ways. Ma Bhaskaranada was her spiritual name but I never knew any other name for her. Bhas in Sanskrit means light and kara is to make. Bhaskara means one who makes their own light. Ananda means bliss. The name suited her well. 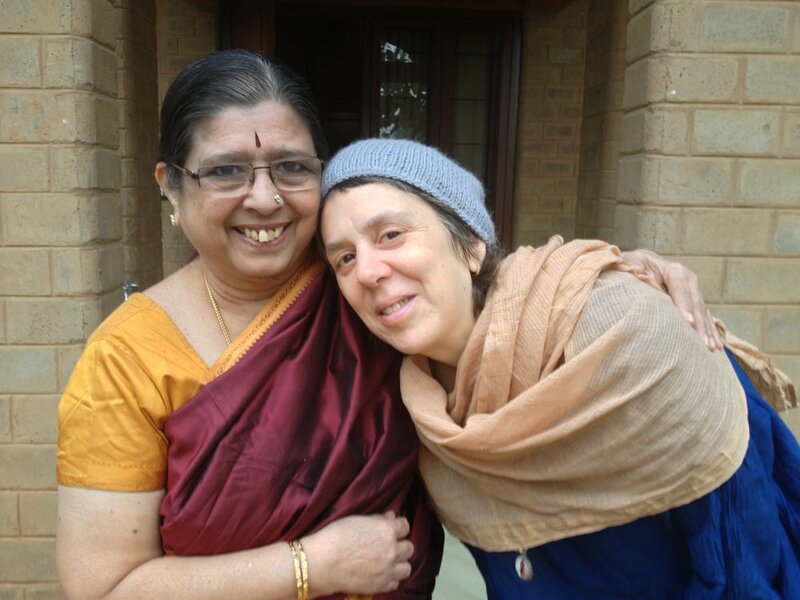 We met at the ashram where she lived. She was to give me Sanskrit lessons. But every time I came for my lesson we would start talking and in no time we had used up our time for the lesson. Then one day she said to me, “let me be your friend and not your Sanskrit teacher”. After which for many years we were close friends. But through friendship she was one of my greatest teachers. I first met Dr. M.A. Jayashree in 1993 when she was singing at Guruji Sri K. Pattabhi Jois's house on account of his birthday. I was deeply moved by the voice and manner of this great woman. When she was finished singing I approached her to thank her. At that time she asked me if I too was a singer. I was touched by her confidence in me but I told her that no, I was not much of a singer. She responded by saying "surely you can sing" and that I should come to her house for lessons. I asked when I should come and she said tomorrow at 4 which just so happened to be the only time I could have gone, it was as if she knew my schedule. So I agreed. The next day when I showed up knocking at her door no one answered, I became frantic and started knocking loudly. Eventually an old man opened the door just enough to see who was there. I told him I was there for my singing lesson with Jayashree. He told me that Jayashree was sleeping. I told him that I would wait. He said that she might sleep for a while and I said, then I'll wake her up because she told me to come at 4. With some hesitation he let me in. And there she was, sleeping. I started to gently nudge her but she was in a deep slumber so eventually I had to use some effort to wake her up. In those few moments I realized how much I wanted the lesson. When she awoke, I said, "Jayashree it's Ruth I came for my lesson". She said "yes we will sing, come come" and I followed her into the singing room. It is there that I, like so many, learned to chant the Yoga Sutra of Maharishi Patanjali. In her classroom it became evident that through singing the beauty and the meaning of the scriptures magically unfold. In the late 90's I was studying music with Dr. Guru Dath in Mysore, India. 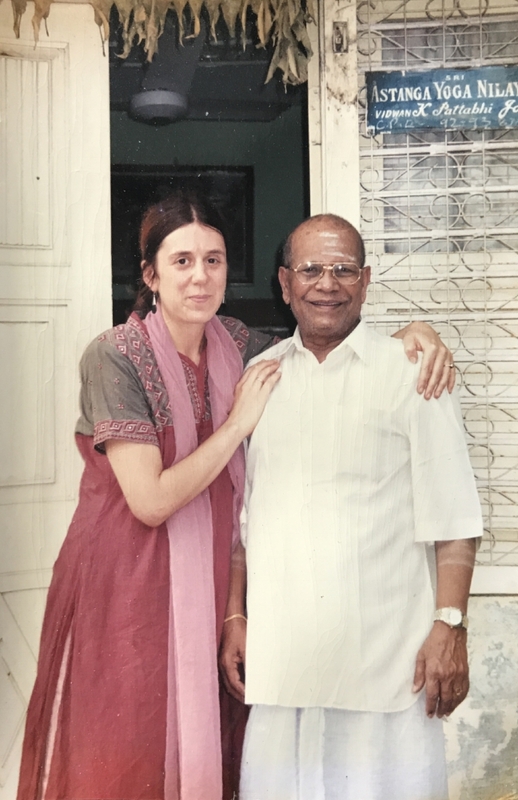 At some point he became so busy that his wife became my teacher, but soon after his wife became so busy that their daughter Ambika, at the time 14, became my teacher. And though I was old enough to be her mother she had a lot to teach me. Ambika taught me traditional songs that were the inspirations of saints and poets of previous centuries. One such song was about a man who was always brought to tears by the beauty that surrounded him. She explained this to me, that most of us cry only on the occasion of our own disappointment, but that this song was about a man who cried over the splendor of things. She and her sister Bhavani have won numerous prizes for their musicianship. Professor H.V. Rao listening while his daughter sings. Professor H.V. Rao is a teacher of Sanskrit. He has received the highest recognition for his work in Sanskrit poetry from the President of India. He was a visiting professor of Sanskrit at the University of Chicago in 1995, 1996 and 2001, a Fellow at the Center for Advanced Studies at the Hebrew University, Jerusalem and the Honorary editor for Sudharma Sanskrit Daily, the only publication of its kind worldwide. After he retired and was no longer giving formal classes he agreed to see students one-on-one in his home. During our sessions he would give the most poetic descriptions unveilingthe essence of the Upanishads through metaphor, poetry, pathos, and vividness, humbly expressing his insights after years of study and reflection. Years ago I was in Mysore going for my evening walk when I heard singing. I followed the singing back to a particular house where I realized the singing was coming from. Outside I left my sandals along with the many other pairs and let myself in the house. I could hear the signing was coming from upstairs, I went up and found a small room filled with people singing devotional songs to God and their Guru Sai Baba. One lady noticed me standing in the doorway, waved me in and quickly made a spot for me on the floor. The woman leading the bhajans was Padma who soon after agreed to teach me some basic bhajans. Her level of devotion combined with her musical artistry inspired a new perspective of yoga in me.